First up as this is a beauty blog after all I have to mention how a change of season means new makeup! From new makeup trends to new product launches and also a re-shuffle of your makeup bag. I personally ignore most new trends and go for a staple berry lip (I don't think I will ever fall out of love with Rimmel Lasting Finish Lipstick by Kate Moss in 107) and beautiful metallic eyeshadows. I also love achieving glowy skin as the weather gets colder. Ahhhh there's nothing like a cosy night in with the heating or fire on whilst watching or reading something good!. I'm already thoroughly enjoying snuggling up with a blanket and reading for a few hours with my favourite chocolate brownie candle burning. Autumn is also the perfect time to get hooked on a TV series that gets you excited to watch it every evening - highly recommend Breaking Bad! Colder weather certainly calls for yummy comfort food, from soups to roast dinners and of course takeaway at the weekend! I personally love my slow cooker for homemade soups and live for roast dinners on rainy weekends. I also start to crave warm desserts which may not be too good for my diet but definitely yummy, in fact I'm planning on making Gooey Nutella Banana Bread this week, mmmm (possible blog post?). It easy to believe Halloween is just for child however watching a night of scary films or even classics such as Hocus Pocus and Casper can be a great way to celebrate Halloween. Also carving a pumpkin and decorating it is a fun experience whatever your age. I now fully embrace Halloween and look forward to it every year! Bonfire Night is another event to look forward to in Autumn, whether it's staying indoors and watching fireworks from your window or braving the cold by wrapping up and enjoying a real bonfire and fireworks display. There's just something about the warmth of a bonfire on your face and tucking into a warm hotpot or something equally yummy whilst stood out in the cold. A change of season means a new wardrobe - always an exciting thing! For me out come the black tights, ankle boots and check shirts. Also a scarf or hat can be such an easy way to change up an outfit. Finally there are programmes to look forward to! I'm talking X Factor, Strictly Come Dancing, Downton Abbey and The Apprentice. Weekend telly is definitely sorted! Dramas are also not to be missed come Autumn with series such as Our Girl and Cilla to enjoy. Come colder evenings there's nothing like setting aside some pamper time. This could be sitting reading a new book with a yummy hot chocolate or smothering on a face mask and enjoying a long soak in the bath. I also love getting in to the habit of giving myself a manicure each Sunday night. There's no mistaking that Autumn is a beautiful time of year with fresh sunny mornings and golden leaves covering the ground. Getting out into the fresh air for a walk is something I love to do to feel relaxed and to realise just how amazing nature is! It's also a lovely time to spot more squirrels and go conker hunting. 10. The countdown to Christmas! Yes, we may all be resisting that Christmas is a-coming but once Halloween has come and gone it's time to embrace the most magical time of the year! From gift shopping to involuntary singing of Christmas songs there no denying that a little sparkle gets into us all come the end of November... I for one can't wait! 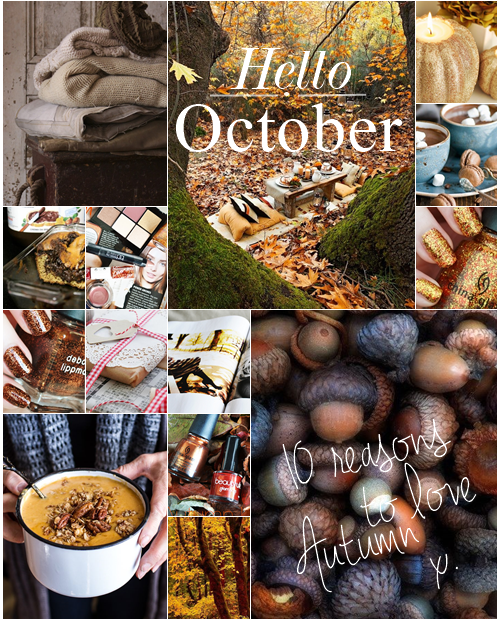 I'd love to know what you love about Autumn/Fall in the comments below!